At Chaaps, we mostly cover latest tech stories and happenings in technology industry. Starting today we will also be covering the news connected to automotive. Today we are listing the top brands in India which covers the latest automobile news. The oldest of all the available auto-portals in India. Team-BHP started like a forum and now has a huge dedicated automobile fans. It mostly covers news related to Cars. Exclusive reviews , photos and community engagement are its highlights. Carwale is an auto portal which serves as a discovery portal for various car brands. Carwale also lists out used cars, a dedicated tool to do a basic research on various car models and brands, Carwale also recommends to use one sure insurance for either new cars or used cars. GaadiKey blog is a emerging blog in Indian automobile industry. The blog at GaadiKey is a good source for finding new cars and bikes. Unlike other blogs GaadiKey covers both cars and bikes. You can find out about latest car and bike news at blog.gaadikey.com . Please let us know if you come across auto-blogs targeted at Indian audience. If you logged on to Facebook today and hovered your cursor over a Facebook page or user’s name you may of seen the new Facebook hover card. A hover card is a small popup window that appears with information about a user which includes: there name (page or user), there cover photo, friends that like the page or friends in common, their occupation, and some instances an overview of the user. Below is an image of what my hover card looks like when I view my own. user (depending on their privacy settings).If i didn’t know better it seems that Facebook is making a business type card for users for everyone to see, as well as making it easier to socialize with people on Facebook. Back in 2010 Facebook had a feature like this that pop ups to show information about a user’s interests and being able to delete and add as a friend making it simplified so you don’t have to make a million clicks to add a person or message them. This feature will enable users to save a lot of time from having too have clicked all over the place. In my own opinion this article will bring great meaning to Facebook and its users, epically considering recently Facebook has been adding several new features and changes for a couple of weeks, and what more is to come? What do you think of this new feature i consider awesome? Google's Plus One Buttons now features a new look: Increases Engagement! Just recently Google has rolled out a new slick set of Google Plus buttons for its social networking platform. Google tells us the new buttons are sure to increase user engagement on your site. Today, we released the new +1 button from preview and it’s now rolling out to all users. You may also notice the numbers in your +1 buttons increase, as we update our plugins to better reflect social activity around your content. There’s absolutely no need to change the Google Plus button code if you are using it on your site. Google says the new G+ button will automatically be updated gradually to all the public, so the webmasters should not be worried if their +1 button did not get an updated look. Give it time! Personally, i loved the old Google+ button because of the multi-colored upper border on it. But the new look isn’t so bad. A combination of red and white simply gives it a minimalistic look and doesn’t look bloated. I am sure people will immediately start +1’ing content and you should take advantage of this to flash your G+ badge across all your sites. Be sure to feature your Google+ Standard Page Badge on your site and give users the opportunity to add your page to their circles and Plus one your page. The more number of Plus one’s you collect, the more number of friends will start recommending your posts across Google+ and you will gain more exposure. Have a say on this story and tell us if you love the new Google Plus One button’s new look by making a comment below! Thank You and keep enjoying Google Plus. Haven’t yet added the Google+ Button? Get it from here. You can also check out the whole collection of Google+ buttons of all sizes and customize it according to your taste out here. Angry Birds just got better! Angry Birds is played 300 million minutes per day according to the Telegraph. When that’s the case, why not make this game real. mbed, the company selling usb microcontrollers decided to improve its sales by making its product compelling to buy. That’s why they came up with a hack to improve the Angry Birds experience. Of course, it wouldn’t be a proper slingshot without being handcrafted from a piece of wood. mbed selected an appropriate branch and bored out the insides so as to fit the electronics and USB connector. All that’s missing now are the grumpy birds and the levels to be built up in real life. While the controller may not convice officials to brand it a sport just yet, it could certainly become a fun multiplayer game to play with friends and family the next time they visit. As Mbed’s video below suggests, just use a projector for full-size fun. 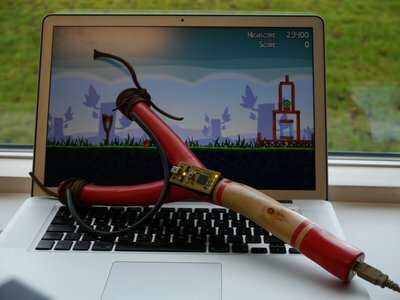 The good news is, there’s nothing to stop you making this slingshot for yourself. All the components are widely available and relatively cheap to buy, and mbed have released instructions and code for creating their prototype as described here. Enrich your Facebook Chat experience by using your friends’ profile picture within the chat window. The recently discovered facebook chat hack what mashable calls it as Facebook Chat Gimmick is making quite a lot of news. The hack is all about using some special codes and tags to generate emoticon sized profile pictures within the chat window. Isn’t it good to show up your buddy’s image in a group chat rather than plain vanilla text? The above chat window says it all. So how do we try it? Open your chat window and start using these tags in your conversation. To link your Friends, Just use their facebook ID and enclose with 2 square braces..
That’s it for now. Thanks to GeekoSystem. DO Share your views by commenting below! an understatement. Man, what awesomeness I tell you. While the rest of the sites were trying to beat facebook, Facebook gave not a damn to stop them come up but they came up with something unique, something wonderful. And what’s that? Yes, the Facebook timeline that they launched a few hours back. Looks pretty. Right? Scroll down, shall we? Awesome alright. A lot more features were announced at the F8 conference, yeah. But I’m sorry, I’m overwhelmed by the awesomeness of Facebook timeline. How do you get Facebook timeline? 1. Wait. You’ll get to see it, and to use it by 29th September, 2011. 2. Follow the Procedure that Rahul Banker suggests.